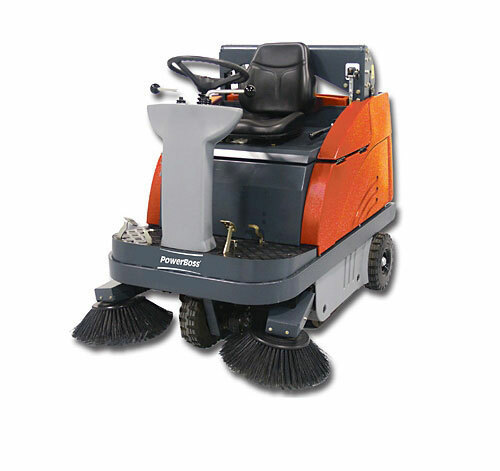 Demo Powerboss Apex 49 Rider Battery Sweeper 40"
The Apex 49 Rider Sweeper is designed for heavy-duty industrial use. It is constructed on a steel frame and the panels, made of a synthetic material, are virtually indestructible. With a 90-90 turning radius, the Apex 49 battery floor sweeper is extremely maneuverable. This is a demo Powerboss floor sweeper with low hours and is comparable to a new machine. 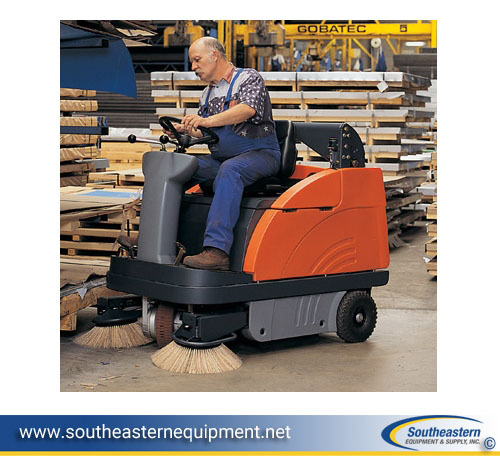 The Apex 49 Rider Sweeper is designed for heavy-duty industrial use. It is constructed on a steel frame and the panels, made of a synthetic material, are virtually indestructible. With a 90-90 turning radius, the Apex 49 is extremely maneuverable as a result of the directly steered front wheel drive. This battery floor sweeper is easy to operate, even in the narrowest of aisles. The Apex 49 provides perfect sweeping results due to the large, newly developed main broom with compensation for wear and tear. This rider sweeper is available in gas, propane or battery and with a choice of hydraulic high- dump or manual low-dump hopper. The engine and battery compartment are clearly laid out and directly accessible for maintenance and servicing purposes. The seat console simply tilts backward to reveal the compartment. The seat is also equipped with a safety shut-off switch. If the operator gets up from the seat, the Powerboss floor sweeper will shut down.